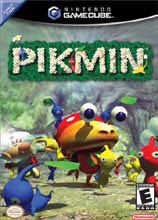 I started playing PikMin last night. I know hecka old game, but it was on sale and I never played it before. I started playing it around 1:30 and kind of got caught up with it till 4am! It is pretty fun. I usually have trouble with these types of games because of my poor hand/eye coordination. Let's see how long it takes me to finish it. I'm on day 6 out of 30.